Take a tour with Wynne. Home » Take a tour with Wynne. With the all the recent recalls on store bought pets foods (see our “In the News” section) it leaves people wondering about processing standards of pet foods. There are a lot of good quality store bought foods out there, but one of the reasons I prefer to feed Yukon and Charley, my Golden Retrievers, prescription foods sold at veterinary clinics is because I am aware of the high standards prescription food companies use to process their foods. 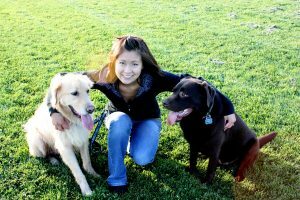 Wynne of the Amberlea Animal Hospital in Pickering with her dogs Sam and Remi. I had the opportunity to attend a one-day tour at the Royal Canin/Medi-Cal plant in Guelph, Ontario. For those that are not familiar with this company, Royal Canin is a worldwide manufacturer and supplier of high quality, specialized dog and cat foods in the veterinary, pet specialty (pet store), and breeder channels. Its headquarters are in France and production operations exist in 10 countries around the world, including a new Canadian plant opening in Guelph in 2008. The company has a comprehensive veterinary exclusive line of diets under the Royal Canin/Medi-Cal Veterinary Diet brand name. When I arrived at the plant, I was amazed at how large the facility was. Once when I parked my vehicle and got out, I was expecting it to smell like food. To my surprise – nothing! I couldn’t smell a single thing! They have the state of the art air filtration system in their plant which filters everything so finely that when everything is done circulating in the filters, none… absolutely none of the pet food smells are released into the open air in the public. We walked through the main reception area and was greeted by the friendly staff. After our meet and greet, we were ready to get suited up and start our tour. For individuals that want to take the tour, they are required to wear a sanitized cover over their clothes, special glasses, hairnets and a safety hat. We were told that we would start our tour backwards, meaning from the packaging stage, then to the raw stage. For the staff that works there, when you are designated to work in one part of the plant, you are not allowed to cross to another zone. For example, if you are working in the raw area, you are not permitted to step foot to the packaging zone, and vice versa. They want to keep everything under control and reduce the risk of any chance of contamination. Walking towards the packaging area, I could see all the hard workers making sure everything was being done properly. Machines were clean, and the floors were clean even during the packaging process! Everything is done so in depth, with so much attention paid from the raw state to the packaging state. When the raw ingredients arrive, the trucks wait at the plant until multiple samples are tested right on the spot at their lab. They want to make sure that all the ingredients that come in are free from contaminants. If there are any, they will tell them they will not be accepting that shipment. After the kibbles have been produced, a small sample is always collected and tested, just to make sure the formulations are always correct. They have in depth cleaning at their plant very regularly. For the owners who have they pets on a more limited ingredient diet because of sensitivity issues, they can rest assured that the foods they are feeding their animals are safe. After doing a thorough clean, the limited protein source products are always made first. They also have a separate facility where the lab is. At the lab, you see very hard individuals testing away. They are making sure that there are no contaminants in the plant or food. They do more thorough research on certain strains of bacteria/contaminants that were potentially found in the shipments of the raw materials. This allows them to further educate themselves about how to ensure safety at all times with the food and produce a safe and healthy quality food source to our pets. After when the tour was done, I walked away with so much information regarding the company and the plant itself. I was surprised by how much detail, effort, hard work, and care is put into making food for our pets. Thank you Royal Canin/Medi-Cal for this opportunity. Wynne.